Fitoons is a brand new app (launched today!) for children aged 4+, which aims to inspire kids to eat healthily and add exercise to their daily routine. When I was asked to review Fitoons, I agreed straight away as I strongly support its message. As parents, it’s our responsibility to encourage our children to make good choices and balance healthy eating with daily exercise. Unfortunately obesity continues to be a growing issue among children. We do try to make sure that we talk to our son, Ethan, about the importance of eating healthily and doing lots of exercise. We’ve made reward charts to encourage him to eat his five a day. While you can educate and lay the foundations for good choices later on, it will ultimately be up to them whether they choose to lead a healthy lifestyle. Fitoons is designed to encourage children to make healthy choices for themselves. It was created by Avokiddo, a small independent studio known for developing award-winning educational apps for children. All of their apps have won awards and recognition. Two of their most popular apps are DNA Play (teaching the basics of understanding DNA) and Thinkrolls 2 (a logic puzzler). Knowing this, I had high expectations for Fitoons! With making healthy choices at the heart of its message, Fitoons is based on freeplay. Users are free to play and explore as they wish, winning stars as they go along to unlock more foods and characters. If you touch the character’s face, you can also adjust the skin tone, which is a nice detail. Once the character is dressed, you can start exercising. There are 20 different sports for your character to train in. Some activities are in the gym, such as lunges and weights, and others take place outside in the fresh air, such as cycling, skateboarding and trampolining. Ethan is always asking me what grown-ups do at the gym – now he can find out for himself! What I really like about training your character is that it is all done in real-time. So getting them to complete the exercises properly requires some precision and timing. You can also hear them breathing. The healthy meter in the bottom left-hand corner monitors your character’s progress while playing. As well as exercise, your character must also choose healthy food to eat. The kitchen is great fun. There’s a choice of 45 different foods – a mixture of healthy and not so healthy! Your child will be able to watch their character’s weight go up and down, depending on the food choices they’re making. If they put on too much weight from eating, they can go and do some exercise to work it off. There is even a ‘vegan’ setting available! You can also prepare and cook the food. There are six different kitchen appliances to use, and Ethan found these really good fun. I watched him put a chicken in the oven and fry a sausage. There’s even a blender, so they can try out some crazy smoothie combinations if they like! Ethan is highly selective about what he eats, so I think games like this that make food fun are great. You never know, he may eventually be encouraged to try a wider range of foods – that’s the dream! A crucial test of a good app for kids is how easy it is for them to use. Ethan was super excited to try Fitoons and was asking to play it as soon as we got home from school. I handed over his iPad with Fitoons freshly installed and just let him play with no instructions. And he was straight into it and happily playing away without needing any help from me, which was brilliant. Ethan dressed his character and started exercising – he especially enjoyed the trampoline and skateboard. He said that he found the boxing quite tricky. Like most kids, a sense of achievement is important to him, so he kept a close eye on the healthy meter and was really pleased when the needle moved closer towards the green. He enjoyed choosing food in the kitchen and filling up his character’s plate. When his character put on some weight, Ethan immediately got her to do some exercise. We love Fitoons! Ethan told me that he really enjoyed playing it. The design is modern and cool, and the characters are fun. It’s easy to use, and it’s promoting such an important message that I think we can all get behind. Fitoons even inspired Ethan to create and draw his own workouts! How cute?!! The app costs £3.99 and there are no ads or in-app purchases. All content has been deemed safe for children. 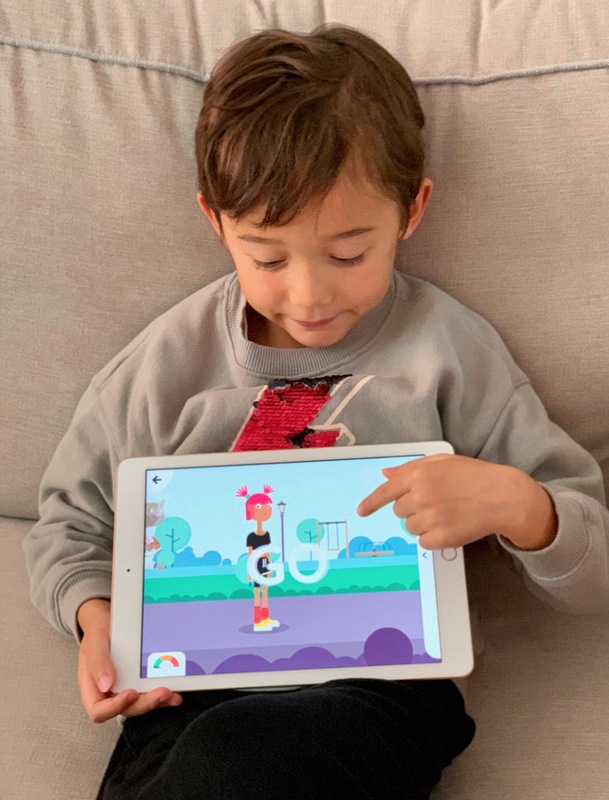 I think Fitoons is a great concept from a company that seems to really care about the apps that it is putting out there into the world, in front of our children’s eyes. There has been great attention to detail in its development, and inspiring children to make healthy choices is obviously a topic that is close to the Avokiddo team’s hearts. Overall, Fitoons gets a big thumbs up from us! You can buy and download Fitoons here. If your child tries Fitoons, we’d love to hear how they get on. Please share your comments below. Thank you! Disclaimer: Mums Off Duty received a free download of Fitoons, and payment, to write this review. My reviews are always completely honest.